Welcome to our Fall Home Tour. I want to thank Marty from A Stroll Thru Life for hosting. For those of you who have been along for this ride for quite some time, I have made a few changes to switch things up a bit. But if you are knew to my blog or joining me from My Sweet Savannah it’s a pleasure to have you here. My philosophy is all about creating a place you love to be. We may not have a grand or fancy home, but it is filled with little touches that are meaningful and special to us. And at the end of the day, it’s all about the people who fill your home and creating a beautiful place to laugh, learn, snuggle and feel loved. Welcome. Come on in. So it is still in the 90s here and we are not quite ready to bust out the entire slew of pumpkins, but I did infuse fall with some warmth and texture. I picked this wreath up from HomeGoods. I liked its simplicity and neutral color. I decided to use books this year to welcome in Fall. Just seems appropriate because it’s back to school time and we are a family of readers over here. I kept it simple with the owl bookends, a touch of gold glam and magnolia leaves from our yard. If you are new to my blog, the subway sign is a collection of streets my husband and I grew up on and have lived on together throughout the years. A tutorial can be found here. The mirror was a HomeGoods finds but they do sell a similar one from Z Gallerie. The oar belonged to my brother and is a nice reminder of him. Our cozy living room got a fall update with some new buffalo checked pillows. 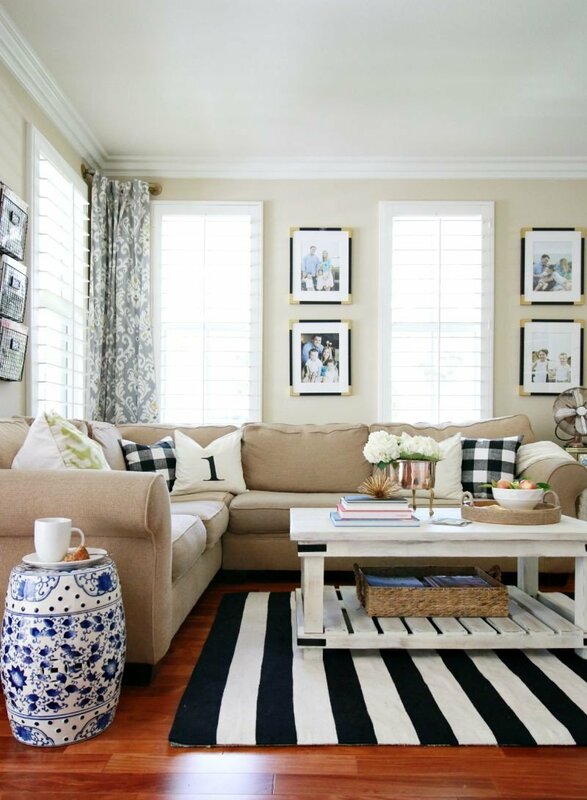 I love the black and white against the neutral sofa. The number pillows were one of my very first blog projects years ago! The rug was found at HomeGoods but I found this one online in case you are a striped lover, too. I can’t get enough of black and white stripes. The frames were also a DIY (so simple) you can check out here. I suppose what they say about fashion and decor styles going hand in hand is sure true in my home. I guess it’s safe to say I gravitate towards black & white, gingham, neutrals and blues in my fashion, too. 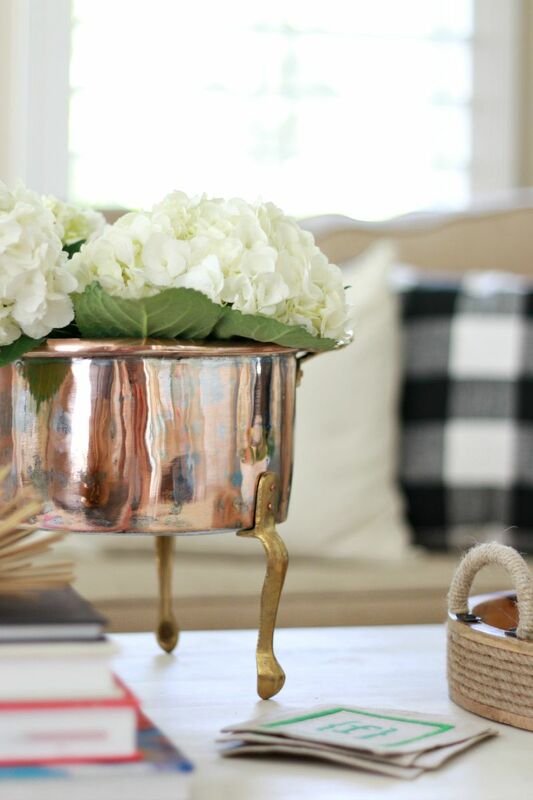 My favorite new addition is this copper pot. I love that it is elevated and creates a really pretty vase for flowers. It was a recent HomeGoods find. The cute coasters were a gift from my dear friend, Megan. 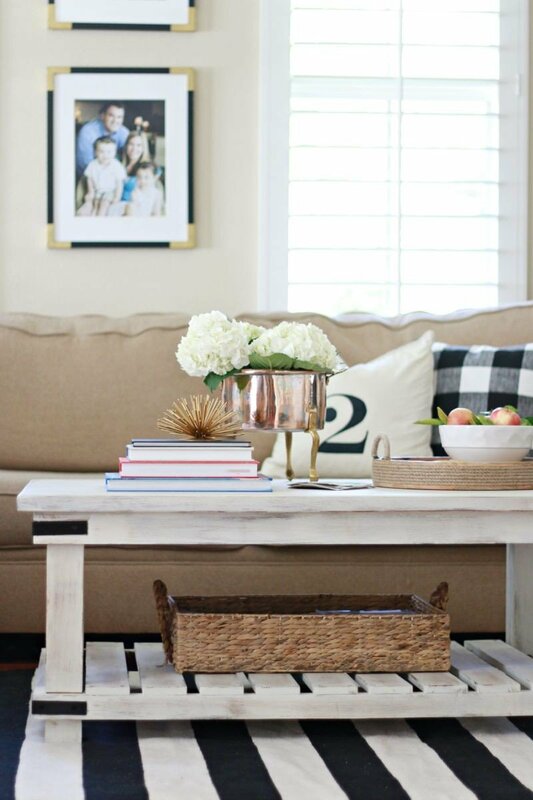 This coffee table has been such a great addition. It comes in a light brown wood but we painted it ourselves. The basket below is a life saver. It hosts one million magazines as well as the children’s Highlights mags. Keeps us all clutter free! I think the best fall touches are those that are natural. 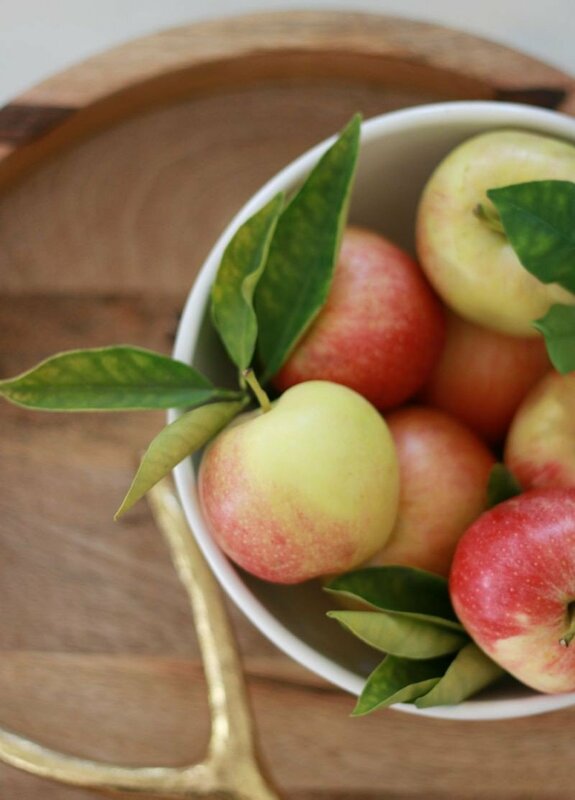 Sticking to fresh fruit and greens cut from the yard, an easy centerpiece is made. I also picked up this garden stool at HomeGoods. I was checking out and saw it on the shelf behind the register. It took me 10 seconds to ask them to kindly place it in my cart. 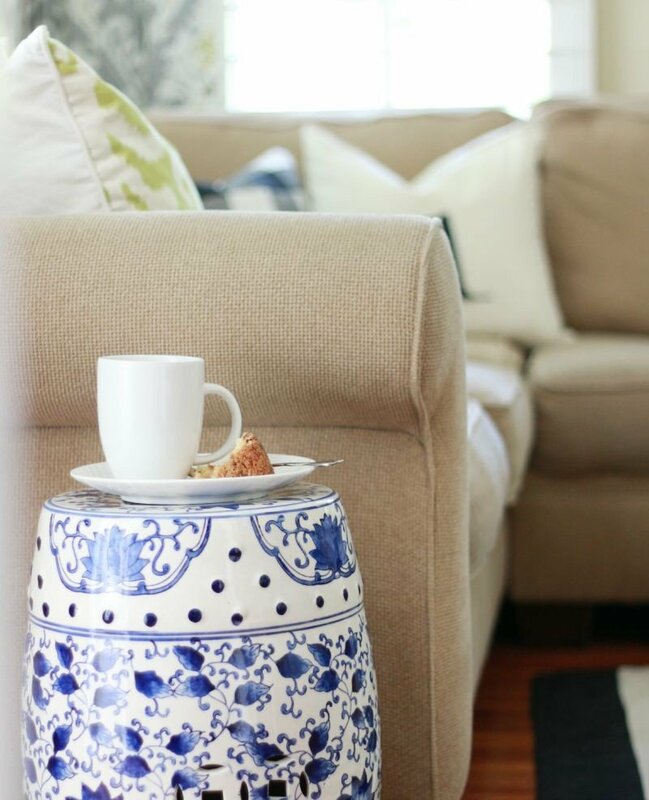 If you pop over for coffee on any given morning, you can set it there while we chat away the day! Our sofa was custom for the space but we copied this one. If you round the corner you’ll find yourself in our dining room. Tried very hard to get a view of our patio, but alas my camera skills failed me and I kept blowing out the window. Tips accepted! 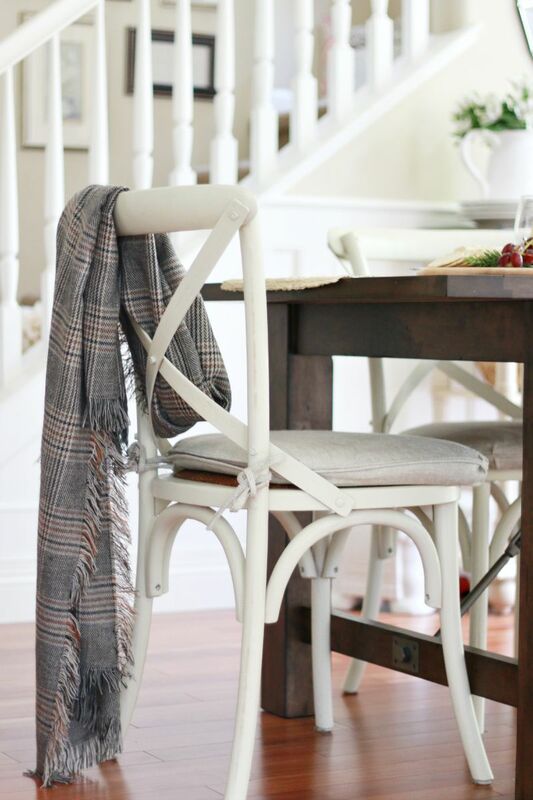 Grabbing a fall scarf from my closet is a quick way to warm up the space and give a nod to the coming season. I also like to use scarves on the table as runners. The fall table I created includes my easy pumpkin craft and plaid fall chargers. Fall always reminds me of spending time with friends and family. 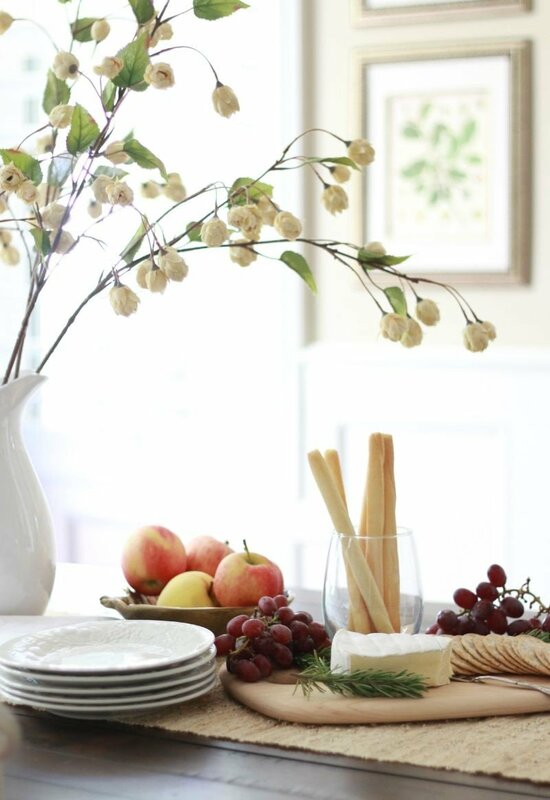 I have a passion for entertaining simply. You can see my video tutorial for quickly putting together a meat and cheese platter right here. 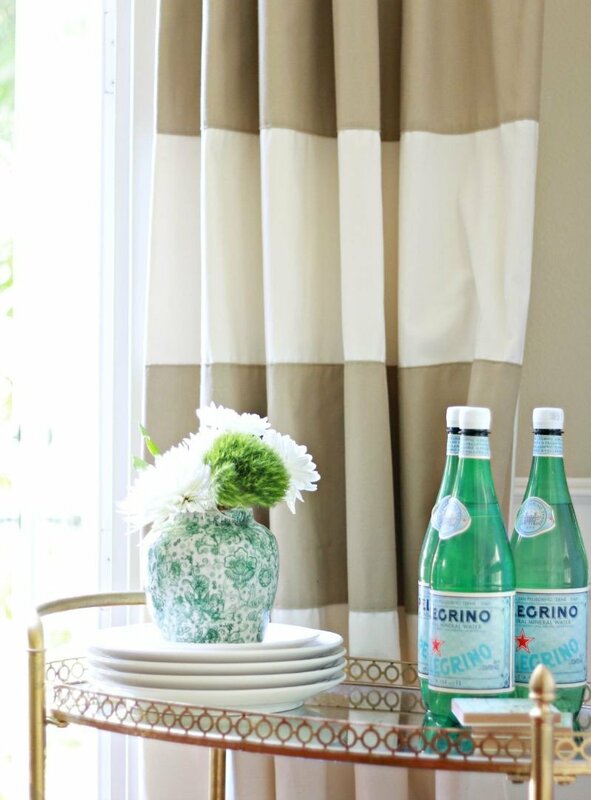 This table runner is a Target find and adds great texture to the tabletop. The nearby bar cart is kept clean and simple with fresh stems and bottled water. The plates are easy to grab when we have more people for dinner. The striped drapes were one of my first DIY projects in this home. As I mentioned before, we love to entertain and when my parents come by for dinner I literally grab extra plates, napkins and glasses from this buffet. I find that if I fill it with things we actually use it stays looking beautiful much longer. And the pumpkins from our fall table get tucked away in this pretty basket. Now head on over to Jenna’s tour over at Rain on a Tin Roof! She has a bold and fearless style you will love. Here are the tours from the rest of the week! Be sure to grab an iced coffee and take a look around. Thank you so much for taking the time to peek around our little home. OMG I love!!!!! everything is so gorgeous! Ah. Thanks so much, Ellen! You’re the sweetest. It’s all so beautiful! 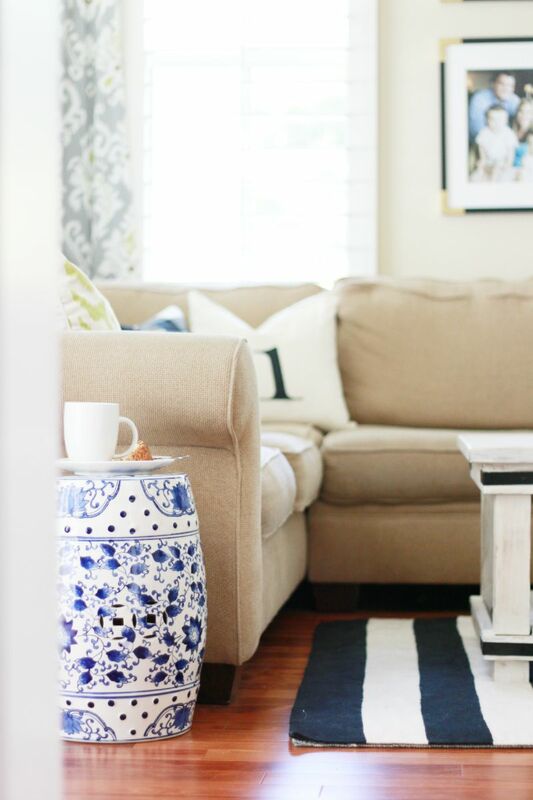 I am a huge fan of stripes and gingham so I always love seeing your home! Thank you, Shelley. I can’t seem to quit those two patterns. They are here to stay! Have a lovely day. Thanks for stopping by. Just GORGEOUS!! 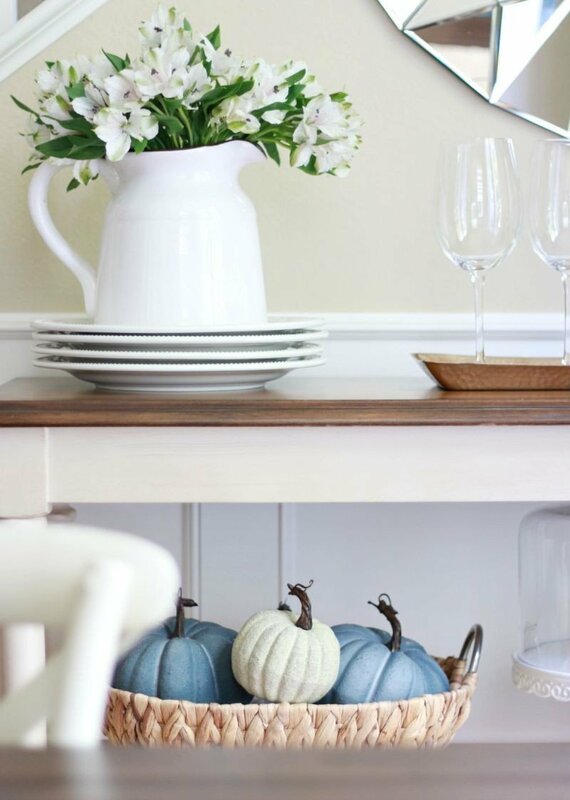 LOVE, LOVE, LOVE the fall touches! Thanks, sweet girls. Now how about some Fall weather! We need to chat about a possible tailgate! I’ll email you. Your home is always so fresh and inviting. I love how you mix the black and white in as accents. Books is a fabulous idea for fall, I need to remember that. Great tour. You have such a lovely home. I love the simplicity and how organized and clean it is. I love those buffalo checked pillows too. Such a beautiful tour Courtney! 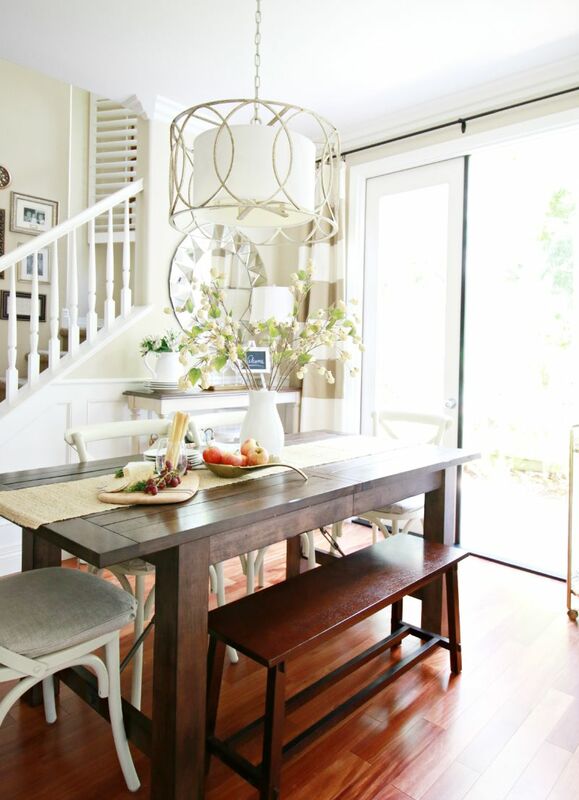 Your dining room has always been one of my favorites in all of blogland! It’s all so pretty and cozy!! 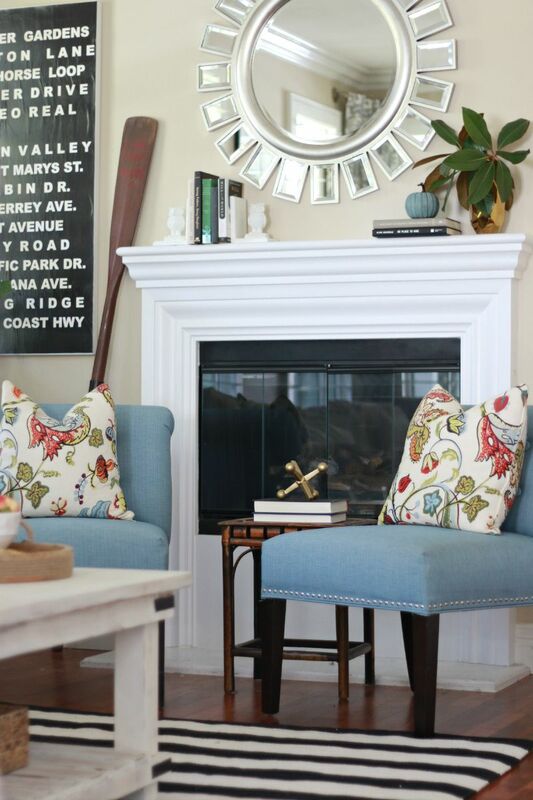 I’m dying over the copper pot, and always love seeing that oar. 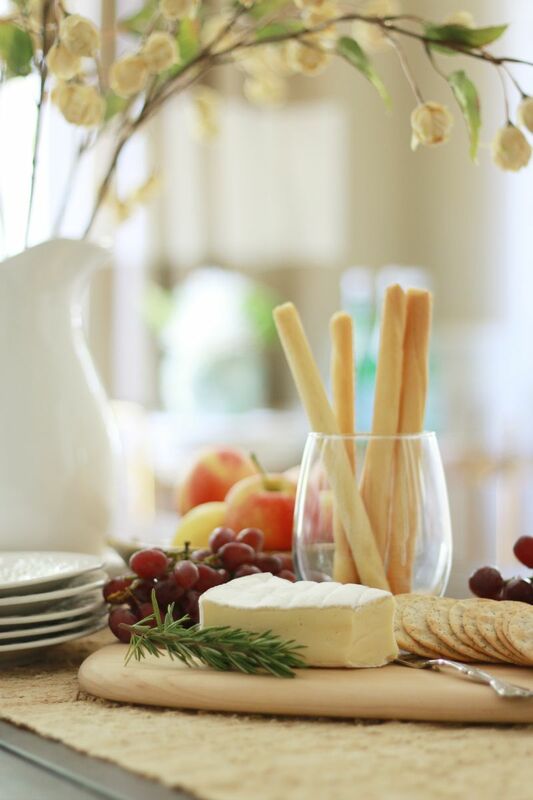 And forget the coffee…I’m coming over for wine and that cheese & fruit tray!! Everything is gorgeous, Courtney! 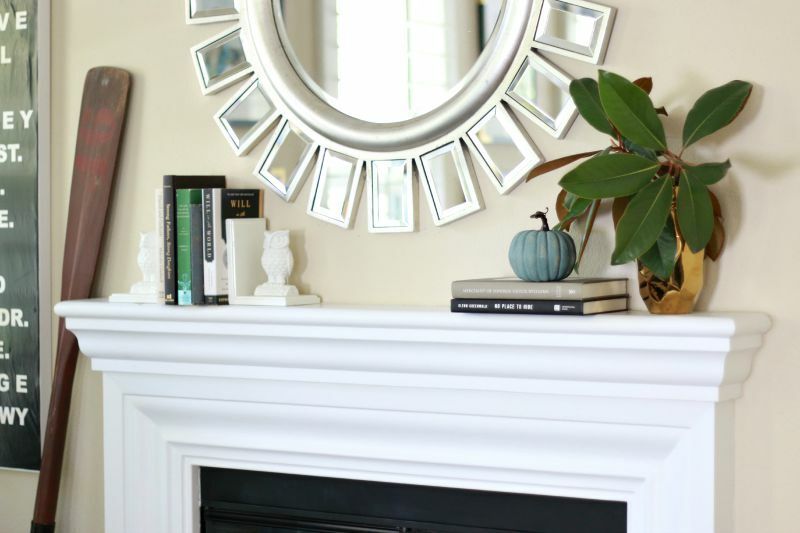 I love the magnolia leaves on the fireplace and all the black and white checks! Your home wonderful and inspiring as always. Than you for opening the doors for us. Beautiful photos as well. It looks so great! A great way to welcome fall! I know you say your couch is a custom replica of the Pearce, but I’m wondering what brand it is? I built a Bassett couch locally and it looks similar. Just wondering details, fabric, etc. Thank you! I’m afraid to pull the trigger and get it. 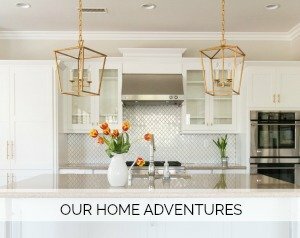 Gorgeous home tour, Courtney! 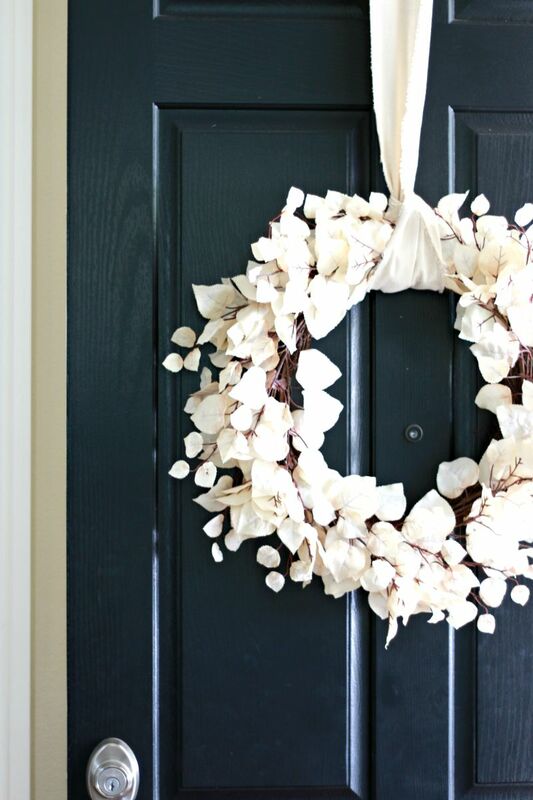 I love the wreath on your front door and of course you living room with the black and white accents, So many beautiful details all around! Just beautiful, Courtney. I love just the hints of the season to come. That gold vase on the mantel… yes! I have a clear glass one just like it and it’s a fave. B&W buffalo check pillows are on my to-do list for the Fall, also… just need to get some fabric! Enjoyed your tour! Beautiful! I love the little details! Beautiful home Courtney! 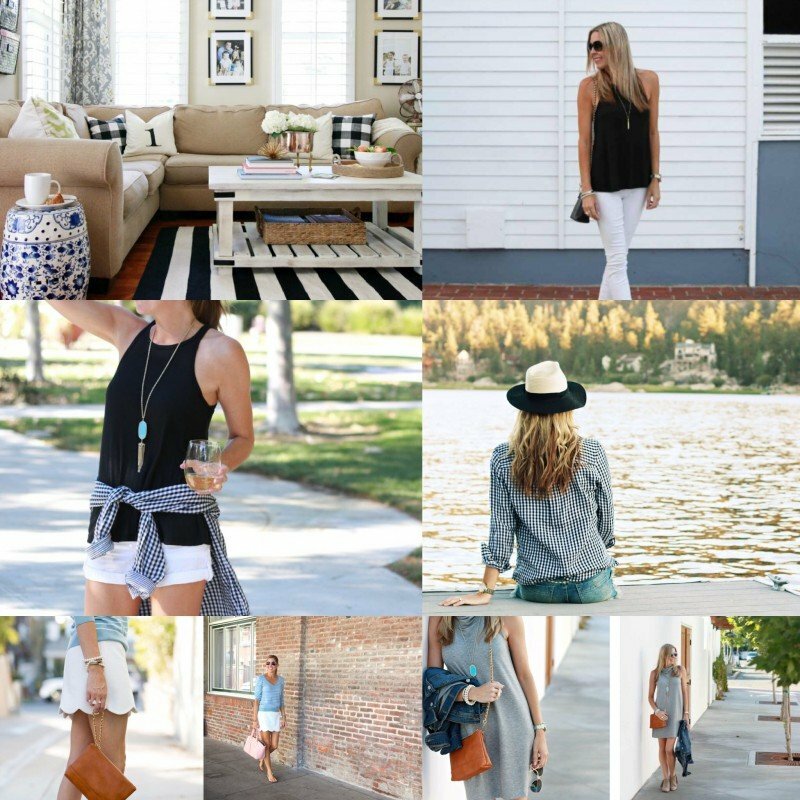 Love the simplicity and coziness of it all, great style and fast you have! 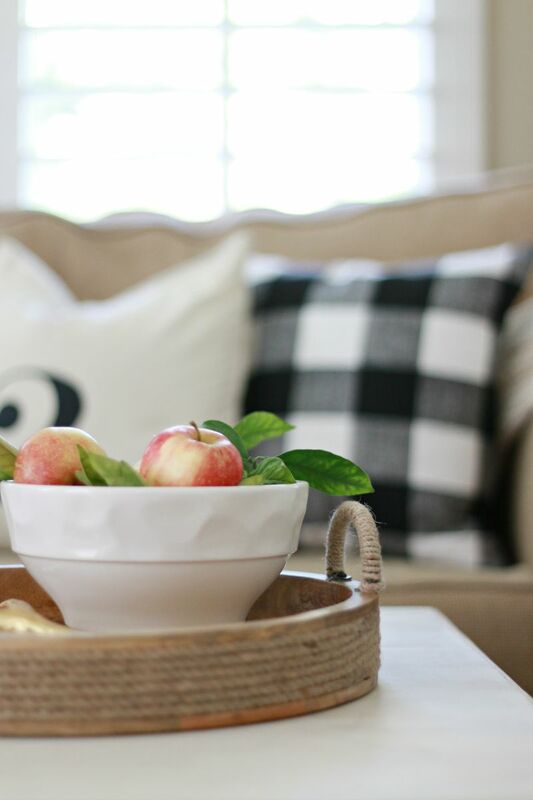 I am stopping by on the home tour and I just love all the gingham and checks you have! I also like those apples on the table, they are a nice way to bring in fall color without bringing in the super orange tones! Courtney, I love every single inch of your fall home. It’s cozy, warm, and welcome, and just looks like a happy place for your family to hang out. Thanks for sharing it! Love love love your tour! I especially love your family photos in your living room and that delicious spread!! Stripes and buffalo check– together!! Now that is perfection! You have a beautiful home and every detail makes it that way. But I’m sure it’s the happy family that lives there that truly brings the most beauty. Well done, Courtney! 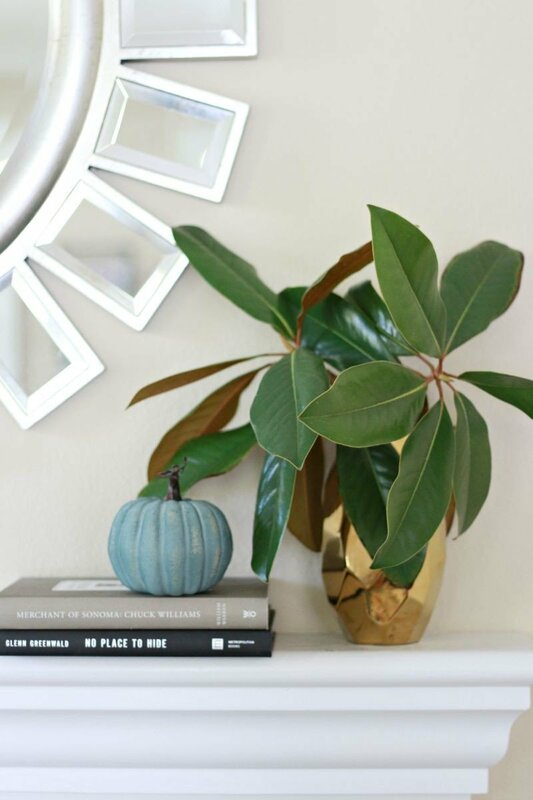 Love your beautiful, cozy and bright fall home. Where did you get (or make) the corner curtain rods? I need them!!! Such a great idea. 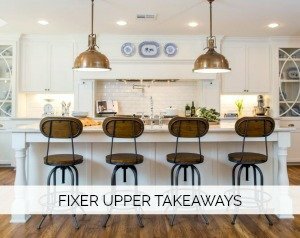 Love your home tour post! Where did you get those adorable blue pumpkins? Beautiful with the perfect touches of pre-Fall. 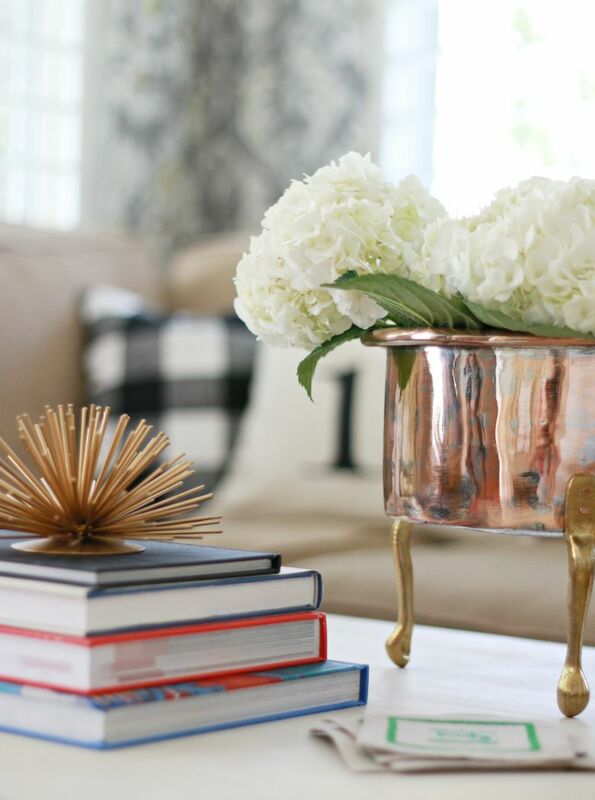 I love decorating with books too! To me it just adds layers and more warmth to a room. Your house is just stunning! may I ask the color of the wall in the living room? Where are the black and gold picture frames from? Lovely color combos. What is the wall color in the living room? What about that darling table too fan peeking out of the corner of one of the pictures of the couch? Where did you get it?